Against the backdrop of the most severe financial and economic crisis in decades, this year’s Council Meeting at Ministerial Level addressed key policy responses to restore financial stability and sustainable long-term growth. The meeting offered an opportunity for Ministers to review progress, advance solutions and enhance co-operation in tackling the challenges of the world economy. We gave special emphasis to policies preventing all forms of trade and investment protectionism and those ensuring that environmental concerns are taken into account when considering the options to address the crisis. 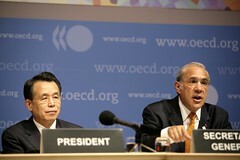 As the centre-piece of the OECD's annual week of meetings and debate on the world economy, the OECD’s 30 member countries held their annual Ministerial Council Meeting in the OECD Conference Centre in Paris on 24-25 June. 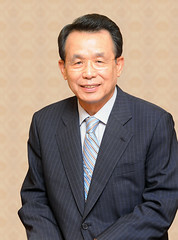 The meeting was chaired by Han Seung-soo, Prime Minister of the Republic of Korea. Korea was assisted by three Vice-Chairs: Denmark, United Kingdom and Italy; representing respectively COP 15, G20 and G8 to enhance coherence and synergy among international fora. To promote the necessary collective convergence in policy and action amongst developed as well as major developing economies, Ministers from Brazil, Chile, Estonia, India, Indonesia, Israel, the People's Republic of China, the Russian Federation, Slovenia and South Africa were invited to participate in all sessions of the meeting. They were joined for the Trade and Investment session by Ministers from Argentina and Hong Kong, China. Representatives from the Bank for International Settlements (BIS), the International Labour Organization (ILO), the International Monetary Fund (IMF), the World Bank and the World Trade Organisation (WTO) are also invited to attend. OECD Week also included the OECD Forum 2009 that was held in parallel with the ministerial meeting and took place on 23-24 June 2009 in the OECD Conference Centre. The Forum brought together leaders of government, business, labour and civil society to share their views on the Ministerial meeting’s issues with the media and a broad public audience. Angel Gurría, OECD Secretary-General, notes risks and presents responses to the economic crisis. Christine Lagarde, France's Minister for Economy, on the proper functioning of markets, boosting employment and ensuring long-term growth. Joaquín Almunia, EU Commissioner, calls for OECD countries to step carefully as they prepare to exit emergency support measures introduced during the crisis.